TOKYO, 27 February 2018 – Japanese energy retailer Looop Inc. announced today the offering of the Looop time-of-use (TOU) tariff – the first of its kind in Japan. The new product was created utilizing smart-meter data and SMAP Energy’s Smart-Meter Analytics Platform – which leverages novel artificial intelligence algorithms to extract behavioural insight. Why is this project groundbreaking? Let’s dive into the context, technological innovation, and benefits. What is a TOU tariff? Energy price changes with supply and demand; higher demand in the morning and evening, when people wake up and return home, raises the price significantly. However, with a single-rate tariff customers pay the same regardless of when they use energy. Ultimately, this additional cost is passed on to all customers in the form of higher rates. If there is the capacity to measure when people actually consume their electricity, then there is potential to reward those who are willing to switch off the peak consumption periods with lower rates and customised energy plans. By charging different rates at different times of the day, TOU tariffs provide a direct financial incentive to consumers to change their energy habits and reduce demand peaks, allowing the savings to be passed directly to the consumer in the form of lower energy bills. Why isn’t this already available? TOU in its full capacity has not been truly achievable previously due to a lack of time-sensitive data. Workarounds have been attempted, but they require either hardware implementation to see and control live usage or a high level of communication with the supplier. These solutions are often too expensive or invasive to consider for all but the largest consumers. The widespread implementation of smart-meters is changing the landscape – with a smart-meter installed, energy consumption can be understood on a half-hourly basis rather than a monthly basis for all customers. Suppliers still need to have a sufficiently advanced system for managing and extracting insight from the data. With a solution like Smart-Meter Analytics Platform (SMAP), suppliers like Looop can better understand the energy consumption patterns of their customers and transform this into new tools to optimise their operations and make innovative offerings for their customers. What is innovative about this project? SMAP Energy has provided multiple pieces of technological innovation and industry insight in facilitating the Looop TOU tariff. First, structuring a TOU plan is a challenge. TOU plans can vary in the number of sub-rates they offer, the time of day these rates are applied, and the size of the charge applied in the periods. Furthermore, the plan requires updating to account for behavioural and seasonal changes. Using a set of preliminary design criteria and the smart-meter data available from Looop’s customers, SMAP’s artificial intelligence (AI) algorithms have identified an ideal structure to maximise both the profit to the energy supplier and bill savings for the customer. Most importantly, no demographic or personally identifiable data was used by the algorithm – eliminating the time, expense, and privacy concerns surrounding this data collection. Second, there was no widely applicable solution for understanding how a customer’s consumption would change in response to a proposed plan or how much savings could be feasibly achieved. Once the tariff structure is decided, typical analysis would apply historical energy consumption (for example, usage over the past year) to determine how the customer’s bills would change. This practice can be subject to error, however, because consumer habits are expected to change in response to the new tariff. SMAP Energy has developed a proprietary forecasting model utilizing AI techniques through parallel research at the University of Cambridge to predict this behavioural change. 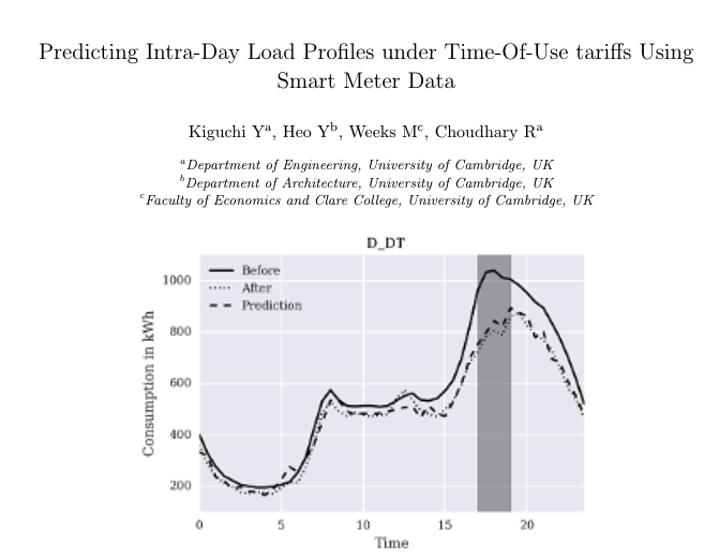 Previous academic studies with the SMAP TOU algorithm have shown accuracy comparable to existing forecasting algorithms while relying only on the historical smart-meter data. New studies performed by SMAP Energy across different geographies and customer segments further demonstrate the algorithm’s robustness as well. 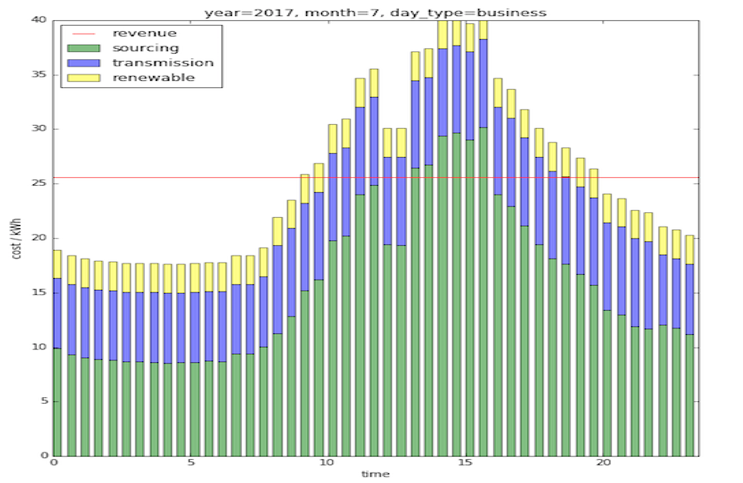 SMAP’s algorithm predicts a 7.56% consumption reduction during the peak periods of the Looop TOU tariff – which neatly aligns with the industry expectation – and this analysis can be quickly re-run seasonally and across different segments of customers as needed. How does the Looop TOU tariff offering work? Using historical energy consumption data collected from the customer’s smart-meter, SMAP establishes a monthly baseline for expected energy consumption. The participants will earn points for reducing their energy consumption against this baseline. Savings will be tracked and displayed via app and web interface. The Looop TOU tariff was created to maximise consumer engagement. Engagement with TOU tariffs in previous academic studies was a problem – it frequently reduced over a long (e.g. one year) time horizon or if the information presented alongside it was too complex. To tackle this problem, SMAP Energy and Looop collaborated to develop several elements for mitigating “participation fatigue”. Simple tariff structure – The Looop TOU tariff will have two steps – a peak period and off-peak period – to make the tariff plan easy to understand. Gamification element – Each participant will be assigned to one of three teams that accumulates points based on collective demand reduction. A cash credit on the total energy bill will be offered to each member of the winning team, and a free trip to Cambridge will be offered to the highest point earner on the winning team. Digital interactive elements – SMAP has adapted an existing suite of data visualization APIs to create a mobile app for participants to track both personal savings and team progress. Emails with a personal message from the team coach describing progress will also be sent daily. Limited window to receive benefits – The first instance of the Looop TOU tariff will be applied for 3 months in the summer period. Participants will only receive the benefit during this period, incentivizing them to maximise participation. With the entirely digital nature of this offering, the campaign could easily be repeated seasonally. The ultimate advantages of TOU and the potential impact of this research are exciting. When properly designed, a TOU tariff plan would incentivise the customer to switch their consumption to off-peak times, reducing the total peak demand. This is an important step for reducing grid stress and emissions, and when acting on their flexibility to shift consumption customers can receive lower energy bills as a result. This result is especially relevant for at-risk populations, such as the elderly or those in social housing, whose limited budget makes energy bill savings relatively more valuable. Furthermore, the offering of such plans has the ability to increase competition in the marketplace, as utilities can seek to attract new customers with plans made to advantage different lifestyles or improve retention by offering plans customised to their users. TOU tariff planning – as enabled by SMAP – is also immensely scalable as it relies only on the utility’s existing data resources and communication channels. Effectively, SMAP’s solution transforms smart-meter data directly into bill savings and increased profitability, making a pathway for any utility to make digital offerings. If you want to know more about this project, further information can be obtained by contacting the SMAP Energy team at info@smapenergy.com.